* Sony Ericsson original flex ribbon cable. 100% guaranteed in excellent working condition! 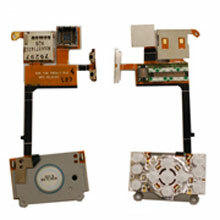 * Compatible with models of Sony Ericsson W580 W580i. * Packing: anti-static bag for each one. * 100% perfect fit, ready to install, install without Modification. Estimated Shipping weight: 0.01 Kg.